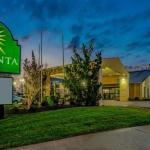 Offering easy routes to the highway and downtown fun plus free breakfast free internet and an outdoor pool La Quinta Inn El Dorado is brimming with convenience. The two-story La Quinta Inn houses 70 rooms featuring free high-speed internet coffeemakers hairdryers ironing facilities and cable TV. Breakfast is on the house each morning. Jump into the seasonal outdoor pool for a refreshing dip during the summer months. Guests keep in shape with a workout in the fitness room. Laundry facilities and complimentary parking are available on-site. Pets are welcome at the hotel for an additional fee. La Quinta Inn lies off Highway 167 about 20 minutes from the Louisiana border. Downtown El Dorado's attractions including historic Newton House and business-filled Main Street are less than two miles away. A five-minute drive west leads to South Arkansas Community College and the El Dorado Conference Center. Moro Bay State Park is a 30-minute drive northeast. Flights into South Arkansas Regional Airport land 11 miles west of the hotel. Dogs of all sizes are allowed. There are no additional pet fees. There is a pet waiver to sign at check in. Dogs may not be left unattended, and they must be quiet, well behaved, leashed, and cleaned up after.